Our backyard boasts some of the best fly fishing in the world and it’s our mission to give you the best experience possible. The incredible variety of water including spring creeks, large freestone’s and perfect tailwaters not to mention the hundreds of miles of fishable water which makes us unique. I would call myself a beginner who has only been fly fishing for about a year and this was an awesome experience. Jesse made the day easy and enjoyable and we were able to learn a lot of new tips from him. Eric was also awesome to work with booking the day. Definitely going to recommend these guys to anyone traveling to Montana. MFG and Josh are a class act! I am a novice fly fisherman and my wife had never fly fished. Josh took the time to teach us the basics and was excellent at teaching. Josh worked hard at keeping us on fish and we were getting bit all day! I cannot say enough good things about our experience today. If you are in Montana you should fish with MFG. We had an exceptional time on our first float trip! Eric hooked us up with Matt and he was not only knowledgeable he made sure we had a good time. We will definitely be going again. We were fortunate to be able to book two days of guided fly fishing with Montana Fly Fishing Guides on fairly short notice. We didn’t catch all that many fish, but Lance worked with us on improving our technique (we’ve both been fly fishing for less than a year) and was both patient and informative. Already thinking about when we can head back to Montana and fish again! Great experience. Jeff was a great guide. Goal accomplished - caught some fish and had a great time. Weather got pretty chilly, but Jeff was prepared with all sorts of gear. Would certainly recommend to anyone and plan to go again with MFG. We had a great time on the Yellowstone with Eric. As a beginner he was great to me. He gave me some instruction before getting in the boat and was very helpful along the way. We had an excellent time catching fish. I would do it again! Thanks, Eric. Had the opportunity to fish the Yellowstone River with Will Lassiter on September 8, 2017 and what a great trip. I am just two years into fly fishing and Will [MFG Guide] help me with my fishing and put me onto plenty of fish, a lot in the boat and a lot if hits. Thanks Eric and Will. My group of 6 spent 3 days fishing with Eric and a few of his guides. This was my first time with a guide and it was a great experience. Zack consistently put us on fish. He watched our techniques and gave us advice throughout the day which helped us land even more fish. Don't hesitate to book these guys. Well worth it. Eric Adams and his Montana Fly Fishing Guides is the best fly fishing guide service we have ever used. The Yellowstone, Boulder Creek, lots of private waters too. The guides are knowledgeable of the area and are on top of what is hatching and where to go. If you are planning on fishing in Paradise Valley these are the guides. For the past 2 years we've spent part of our wedding anniversary fly fishing using Montana Fly Fishing Guides and each time they've over delivered! Our guides have been excellent instructors, knowledgeable, professional and just overall fun, good folks. We plan to book with them again! "Fantastic day on the water!" 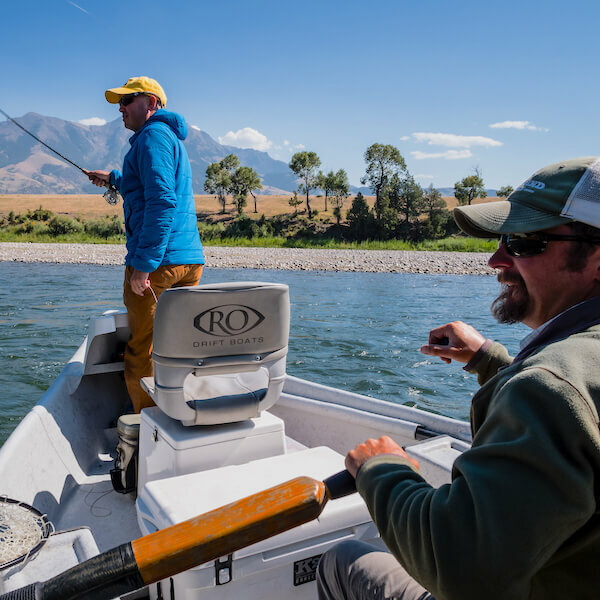 The great thing about Montana Fly Fishing Guides is that they can take a novice fisherman or a seasoned pro and show them the best day they can imagine. [They are] excellent instructors and I always walk away from the trip a better fisherman. "Yellowstone / Paradise Valley Fly Fishing"
From guiding the technically challenging Armstrong to helping my 8 year old son catch his first Rainbow on the fly or floating any stretch of water in Montana. Montana Fly Guides is always my choice. We are already booking for next years trip. Eric Adams and his Montana Fly Fishing Guides offer exceptional world class fly fishing guiding. The personal attention is unparalleled. You will leave with memories and a thirst for more time on the water! Montana Fly Fishing Guides offers professionally guided fly fishing trips for anglers throughout Montana on both famous and lesser known blue ribbon trout streams. We offer a wide range of trips from casting classes, instructional guide trips, day trips, multi-day trips, our exclusive Montana Sampler and even all-inclusive fly fishing packages. Lodging is one of the most important and difficult aspects to coordinate on your Montana fly fishing trip. Let us make is simple for you. We’ve spent years working with a wide range of accommodations from small rental cabins all the way to all-inclusive lodges. We’ve handpicked our guide staff over the past 15 years. You won’t find any rookies or part-time’ers on our core staff. Our Montana Fly Fishing Guides’ staff have all spent years on our local blue ribbon trout streams – they are professional, courteous, knowledgeable, and above all eager to teach others. Give us 3 minutes and watch our Montana fly fishing video above and we’ll give you the best Montana fly fishing experience possible. The area around Livingston, Montana is considered to be a Mecca of fly fishing by anglers the world over. We are located just north of Yellowstone National Park near many famous rivers in Paradise Valley. Nearly a dozen world-class Montana fly fisheries are within a few miles drive and we guide them all. Montana Fly Fishing Guides offers professionally guided fly fishing trips for anglers throughout Montana. Our guide staff are seasoned veterans on Montana’s blue ribbon trout streams – they are friendly, knowledgeable, and above all eager to teach others. We operate Montana fly fishing trips on a number of Montana rivers, streams and lakes including: the Yellowstone River, Boulder River, Stillwater River, Madison River, Missouri River, East Gallatin River, Armstrong spring creek, DePuy spring creek, Milesnick spring creek, Nelson spring creek, and trophy lakes. We also offer trips in Yellowstone National Park on Slough Creek, Soda Butte, Lamar River, Fire Hole and many others. Novice anglers to the most experienced will enjoy exploring the abundant fly fishing opportunities in our part of Montana. We are a full service Montana fly fishing outfitter and are happy to arrange not only your fishing activities but also happy to help you arrange everything from lodging, to dining recommendations and even other activities.